A4 Digital Aerials are Fitting Digital TV Aerials , DAB Radio and FM Radio aerial installation Warrington & throughout Merseyside. All our Engineers are Professional, Friendly & Customer Focused. With Quality and Service Our aim is to offer a Service that is Second to None! While we’re experts at providing aerial installation in Warrington , Liverpool, Wirral, and the surrounding areas, we’re also fully certified independent Satellite installers. 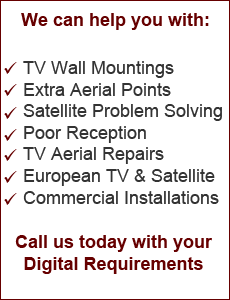 This means that if you need any Satellite system installed we are able to help.